The Infinity Reference 6.5-Inch 225-Watt Marine Loudspeaker is our best marine speakers in which the tweeter has a semi-dome shape made from polypropylene that measures 1 1/4 inches and is grille mounted to give a high end that is crystal clear. It is highly suitable for marine environments due to its durable and strong rubber surrounds that are resistant to UV and sealed polypropylene cone. It has an impedance of 4 ohms and it is a 2-way marine loudspeaker. Our step-up pick is the Polk Audio AA2652-A MM651UM Marine Speaker and it is made from heavy duty steel for its input terminals so it will not tarnish or corrode. The intrusion of water will be prevented due to the design of the completely sealed front and it has passed tests for salt, fog and UV for more than 600 hours. Finding a room to hide will be no problem because of the back of the magnet that has a built-in sealed crossover assembly. 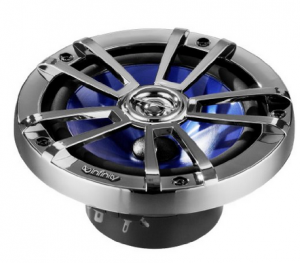 The budget pick is the Rockford Fosgate R165X3 Prime 6.5-Inch Speaker and the cone is made from vacuum polypropylene. It has a rubber sound and included is hardware for mounting as well as grilles. It comes with a tweeter crossover that is integrated. It is a set of 2 (pair) 3-way coaxial speaker. Marine speakers are for use in environments in which water is very likely to fall or damage your vehicle’s electronics and in this way, they are mostly used for boats of different sizes. It will be very boring out there in the ocean or lake and this is why most people who have boats will definitely need marine speakers to help entertain them without the worry of the electronics getting corrosion from the sea. Do the marine speakers have a great water resistant and UV resistant capability and rating? This is the first and foremost thing you need to look for a marine speaker because without it, the speaker will just be very ordinary speakers without resistance to rust and shock that will definitely come if you place it in your speedboat or marine vehicle. What is the price of the marine speakers? The marine speakers are not very cheap but if you do find one, make sure that they are of high quality and have all the necessary features. The price is not the last resort but do make sure you get what you pay for. Do the reviews say mostly positive things about the marine speakers? Make sure you also read the reviews about the marine speakers if they are very great in performance on boats and test fields that are similar to ocean environments and make sure that they do not have a lot of disadvantages that will have a lot of inconveniences for the user. Are the marine speakers elegantly designed but also light weight and durable? The number one thing you need to look at marine speakers is if they are highly resistant to shock and terrible weather. They must be made from high quality material that are made from water resistant material and shock resistant material that will save your speakers and their components from bad weather, hence making them truly the best marine speakers to enjoy and use. What are the capabilities of the marine speakers? Know if they have extras such as Bluetooth and connectivity for various ports such as USB and micro SD so you can play your favorite tunes without the use of a receiver or a component so you can have more convenience for the price of two. Get to know the technical specs of the marine speakers. You must know the specifics such as the power handling and the frequency response as well as the dimensions and the size and the weight of the marine speakers. The impedance as well as the sensitivity and RMS and peak power handling and all of those technical specs. It may be best if you consult someone who is good at electronics and especially with audio and speakers so you can make sure you get the best marine speakers out there without sacrificing quality for being highly UV resistant and water resistant. The Infinity Reference 6.5-Inch 225-Watt Marine Loudspeaker is a 2-way marine loudspeaker which is our best marine speakers. It has impedance of 4 ohms and as for its durability and adaptability, it is highly suitable for marine environments due to its durable and strong rubber surrounds that are resistant to UV and sealed polypropylene cone. In addition to that, when it comes to its design, the tweeter has a semi-dome shape made from polypropylene that measures 1 1/4 inches and is grille mounted to give a high end that is crystal clear. The Infinity Reference 6. Loudspeaker measures 6.5 inches 612 m and as for its power handling, it is powered at 225 watts. For its product build and durability, the marine speaker protects against moisture using magnet structure, sealed cone, tinsel leads and treated spider leads and it is a super high performance marine speaker which only weighs 5 lbs. In addition to all of its features, it of course also protects against water damage and salt damage, as well as corrosion making it a truly remarkable marine speaker. As for being mounted onto any vehicle, the mounting system that it uses is the Intermount III and I-Mount and in addition to that, it also has a Starfish adapter that is tweeter-mounting. Additionally, for its build gear, the cast polymer basket protects against corrosion and UV rays as well as damage caused by salt and water. One more thing to know about the marine speakers when it comes to mounting hardware is that it is made from stainless steel. As for its levels, the sensitivity is at 92 dB at 1m 2.83 volts and in addition to that, response of frequency is from 50 Hz to 20 kHz. As for its power, the RMS power handling is at 75 watts and peak power handling is at 225 watts. As for the depth to make sure it will fit your vehicle or boat, its mounding depth is 2 and 5/8 inches. All in all, the Infinity Marine Loudspeaker is a great marine speaker set which has a 1 year warranty. The only complaint about the Infinity Reference Marine Loudspeaker is that some users say that it does not fit snugly on some Jeep vehicles but it depends on what size you order accurately. Our step-up pick is the Polk Audio AA2652-A MM651UM Marine Speaker which all in all, has passed tests for salt, fog and UV for more than 600 hours so you can make sure of the quality of the product that is super resistant to ultra violet as well as water corrosion. Being made from heavy duty steel for its input terminals so it will not tarnish or corrode, it is super high quality when it comes to durability and strength. In addition, for its compact and portability, finding a room to hide will be no problem because of the back of the magnet that has a built-in sealed crossover assembly. As for its water resistant features, the Polk Audio Speaker will not permit water – intrusion of water will be prevented due to the design of the completely sealed front. As for the build of the grille, the grille is built-in and has a rugged design. And also adding to that, the tweeter mount does not require a conventional tweeter post. This is a coax marine speaker that measures 6.5 inches. It is part of the MM series that are designed to fit any water application. Do know that the price is for a pair of speakers and as for the visual design, colored in gray and silver speaker guard finish. All in all, the Polk AA2652-A Marine Speakers are usable for a lot of boats and marine applications and it weighs 5 lbs. As for our budget pick, we chose the Rockford Fosgate R165X3 Prime 6.5-Inch Speaker which is a set of 2 (pair) 3-way coaxial speaker. As for its build, the cone is made from vacuum polypropylene and additionally, it comes with a tweeter crossover that is integrated and has a rubber surround. Additionally for its mounting, included is hardware for mounting as well as grilles. Also regarding the build and the mounting, the speaker has a high quality midrange and a Piezo tweeter that mounts to the silk dome pole. With an economic price, the speakers are full-range and are also available in other sizes. All in all, these speakers for marine use are great replacement if you have factory speakers and they provide high quality sound with great clarity. As for the user friendliness of the product, the Rockford Fosgate R165X3 is very easy to install and as for the visual impact, the design of the speakers are very beautiful. They are truly affordable speakers which weigh 6 lbs. As for the technical specs, the RMS wattage is at 45 watts to 65 watts and at 4 ohms at 130 watts peak. As for the size of the speaker for marine applications, it measures 6.5 inches. The BOSS AUDIO MCK1306W.6 Marine Package stands out and this marine speaker set comes with a receiver for your total entertainment system for your boat or any vehicle that will be used by this speaker as a travel companion or buddy for your way out in the sea. It is completely and highly absolutely weather proof and will resist rain and humidity on the ocean. As for the size, the BOSS AUDIO measures 6.5 inches and the full range speakers are definitely and absolutely fit for marine use. For its material and build, the speakers are made with poly carbon cone as well as a rubber surround. For the heaviness, the speaker weighs 6 lbs and as for connectivity, it uses an antenna that is marine dipole MRANT10. The receiver that is included in the package comes with a mechless receiver that is single DIN with AM and FM tuner and in addition for its capability and usability, the marine speakers’ receiver is highly capable of playing through USB, SD cards and smart phones and plays mp3 and WMA formats. One more thing to know about the marine speakers’ receiver is that it includes a pair of RCA output and as for connectivity, it also has aux inputs. All in all, the speakers are resistant to corrosion and elements as well as from UV rays them weather proof speakers for marine use. Additionally, when it comes to portability and compact design, the front panel is also highly detachable and provides easy storage. With the receiver that is included with the BOSS AUDIO MCK1306W.6, you can use the aux input as well as the USB and SD ports to your liking and as for accessibility and control, it uses a wireless remote. In addition for the marine speaker receiver, it also comes with a zero current draw memory. Technical specs of the receiver are as follows: the power of the receiver is 50 watts x 4 that has a built in equalizer that has controls for fader, balance, bass and treble presets. Also worth noting is that mp3 players and smartphones will benefit due to the audio out compatibility. As for its power and wattage, the power handlings for the speakers are 180 watts maximum and RMS at 90 watts and for its material, it is made from rubber surround and polycarbonate cone. Also worth nothing for the speakers is that there is a front pre-amp and the receiver itself has no CD mechanism so it is ideal for SD cards and USB drives. The receiver, additionally, also displays the ID3 tags of mp3 files like track number, title, album and artists and the tuner is switchable between US radio or Europe radio. When you order the BOSS MCK1306W.6, the package contains a user’s manual, a warranty card, the dipole antenna, the marine speakers and grills, BOSS harness and hardware, wireless remote and a storage-enabled detachable pane. As for the design, the speaker grills are colored white. As for warranty, it is under a 3 year warranty. The Rockford Fosgate R169X3 6×9 Coaxial Speaker is priced cheaply and do know that this is a 3-way coaxial speaker that is full-range. As for its durability and material, the cone is made from vacuum polypropylene and has a rubber surround and additionally, for mounting, it comes with mounting hardware as well as grilles. Also worth noting about the build of the speaker, the tweeter crossover is integrated and also comes with a midrange as well as a Piezo tweeter mounted with a silk dome pole. The heaviness of the marine speakers – it weighs 6 lbs. As for the technical specs, the power rate is at 65 watts at RMS as the Rockford Fosgate R169X3 comes with high-pass crossovers. You might need a resonance chamber behind. If you want a 4-way speaker, you would want something like the BOSS AUDIO MRWT69 Marine Waketower Speaker. As for its power handling, it is powered at 550 watts and as for its size, it measures 6 inches by 9 inches. Do know that this is a 4-way speaker and as for its specs, the RMS power handling is at 275 watts and the max power is at 550 watts. For its build, it has 2 tweeters. More on its specs, the sensitivity is at 95 dB and the frequency response is from 40 Hz to 20 kHz. With the BOSS AUDIO MR60W Full Range Speakers, the power handling at peak is 200 watts and 150 watts RMS and more for its specs, the impedance is at 4 ohms. Do know that the sensitivity is at 90 dB at 1 watt per meter and the frequency range is from 80 Hz to 20 kHz. As for the size, the marine speaker measures 6.5 inches as it has been made with a 40 ounce magnet structure as well as one-inch aluminum voice coil. Do know that for the design and functionality, this is a 2-way marine speaker and for the heaviness, it weighs 4 lbs. More for its durability and product build, the material of the woofer is made from injection cone made from polypropylene and as for its function as a marine speaker, it is highly water resistant for the spider and surround so that the corrosion will not get in the way in the salty and humid environment of the sea. This is what you need to know about the mounting when it comes to the BOSS AUDIO speakers at full range – the mounting depth is at 2.5 inches and in addition to that, the tweeter is made from 1-inch mylar dome to give high cuts that are crystal clear. One more thing to know is that it has white color finish for its design and to complete it, the speakers have been made with a rubber surround so that it will be able to resist any kind of bad weather. As full-range speakers, it has a 1 year manufacturer’s warranty and 3 years for platinum online dealer warranty. Being made from a cone that is polypropylene for the woofer, it is a very trustworthy product as marine speakers with high quality. As for the size of the product, it measures 6 1/2 inches and as for the design, it is colored in white finish and also, this is a 2-way speaker set. Now, let’s look at the technical specs of the product: the frequency response is from 55 Hz to 20 kHz and at 60 watts is its power handling RMS. Additionally, the peak of its power handling is at 180 watts and also, the sensitivity is at 91 dB. For its functionality as truly working marine speakers, they are resistant to ultra violet and salt water corrosion. As for the ease of use for the users, the assembly is made with integrated grille. For its measurements, it weighs 4 lbs and has a depth of 4 inches. All in all, the JBL MS6200 Speakers are great for camping RVs and similar uses such as boats. If you want marine speakers that will also be used for ATVs and similar transportation then you would want the convenient, user-friendly BOSS AUDIO ATV20 Powersports Component Speakers. As for the design, it is colored in black finish and as for the feature; it is available in Bluetooth and non-Bluetooth. For its build and material, it is made from injection cone poly material and for its functionality as a marine speaker, you have no doubt and absolute guarantee that the marine speakers are absolutely weather proof and for the ease of use, one can be at hassle free with the marine speakers because it has a plug and play feature. And for the other specs, the BOSS AUDIO ATV20 comes with a built-in amplifier that is 450 watts and as for its measurements, it measures 6 1/2 inches. For its usability and flexibility when it comes to a variety of purposes other than boats and marine products, the marine speakers are also very great for UTVs, tailgating, side by sides, and ATVs. The speakers weigh 2 lbs and they are easy to remove and install due to its plug and play technology and in addition to that, the tweeters are made from soft dome PIE. Consistently, woofers are made from polypropylene carbon cone and the signal to noise ratio is at 90 dB for its specs. For the measurement, it has a length of 27 inches and width of 8 inches. For the information on powering it u, it is powered by the 12 volts outlet in which the fuse needed is one 10 amp. To the specs of the product, 45 Hz to 25 kHz is its frequency response range and also it is good to know that the tweeters that are high performance dome and waterproof are measuring at 1 1/2 inches. All in all, the BOSS Powersports Component Speakers definitely and absolutely works great for mp3 players, iPods, iPhones and smartphones due to its audio out and one more thing to know is that it comes with an aux input at 3.5 mm. It also has zip ties and heavy duty straps to keep your speakers in place and the internal amp is a class AB amplifier. This is Bluetooth capable and compatible. It has an absolutely portable design and great for being an indoor or outdoor speaker. With a wireless design, it is waterproof so you can take it to the pool and the surface is made from silicone. Also, it supports Bluetooth 4.0 and is a Hi-Fi speaker with stereo capability and also allows for a hands free phone call due to its microphone. With a design that is superb, it is colored in rubber black coat finish and also, it comes with a built-in battery. For the technology that this marine speaker can support as a Bluetooth speaker, it supports NFC or near-field communication technology. As for its usability and durability, the GBB Bluetooth Speaker absolutely resistant to shock, scratching and dust as well as high temperatures. Do know that the marine speakers are waterproof but not recommended to be plunged into the water. As for the battery information and charging the speakers, the speaker is rechargeable and plays up to 8 hours on a full charge on its 3.7 volts 2,000 mAh battery made from polymer lithium which can also charge quickly on the micro USB port. For portability, the GBB Speaker is very easy to carry for travel for your BMX, hiking, camping, car, office, home, bath-room, boats, or any travel purposes and for its portability, it has a sturdy hook and a super lightweight design. As for giving you information about its connectivity, it has two indicator LED lights which flashes blue when pairing and red for the charging indication. As for flexibility, it is compatible with a lot of devices from Apple products to Samsung, Android devices, Google Nexus and other devices with Bluetooth capability. Weighing in at 1 pound, the audio input is a 3.5 m jack cable and the frequency response is from 100 Hz to 20 kHz. If you wonder about the resistance to water, the water resistance rating is IPX4. The speakers are all at 4 watts x 2 and it uses a CSR chipset to give high quality stereo sound. The connection range of these speakers are up to 30 feet and when you order, the package includes a user’s manual, a micro USB charging cable, a metal hook loop, a 3.5 mm jack cable and the Bluetooth speaker itself and it has a 1 year warranty and 90 days full refund. Marine speakers that did not make it to our list have a lot of flaws that do not make them an outstanding speaker set for your use in boats or out there in the open sea. Q: What are the advantages of marine speakers? A: According to Street Directory , you must know that there are different types of speakers that there are 2-way or 3-way and coaxial speakers. They are very resistant to water corrosion and can survive on any boat environment or at the sea, compared to ordinary speakers that you can use at home or on your car. Overall, the Infinity Reference 6.5-Inch 225-Watt Marine Loudspeaker is our best marine speaker due to its ease of use and high resistance to ocean elements that might corrode it plus it gives a high quality sound due to its high end specs.